Compare Pizza Stones and Pizza Pans: Which Makes the Better Pizza? It doesn't matter whether you prepare your own pizza dough or purchase it ready at the supermarket, the success of your pizza depends on how you cook it! And the very first thing that you need to decide on is the type of surface that will support your dough while baking in the oven. The best results are obtained using either a pizza stone or a metallic pizza pan. Both types, when made from the right type of stone or metal, and when properly designed, create the two most important requirements for perfect results: heating rapidly the bottom of the pizza and reaching rapidly a uniform temperature throughout the crust. This article will describe pizza stones and pizza pans so you can clearly decide which type of pizza cooking support is best for your needs. A pizza stone is a round or rectangular stoneware slab used to support the pizza while it cooks. The body of the pizza stone is full of tiny pores which absorb and accumulate lots of heat when it is heated. When the dough is placed on the preheated porous stone, the pores absorb moisture from the cooking dough, the bottom of the dough gets heated right away, and heat is also distributed evenly throughout the crust. As a result the pizza is able to cook uniformly, resulting in a crisp crust with no danger of the bottom getting burned by the time the pizza toppings are cooked. Pizza stones are usually made of terra cotta, and they come in varying sizes and thickness. 15" stones are probably the popular. Some pizza stones come with an edge (also called "lip"). The main problem with pizza stones is that, if they are not made of superior quality, they could crack or break if they undergo sudden temperature changes or if they are dropped. A pizza stone should always be placed onto the middle rack of the oven and before the oven is heated. Once the oven and the stone reach the required temperature (usually about 425ºF) the pizza should be placed on the stone for cooking. Important to note is that because they are porous, pizza stones will absorb liquid detergents. Therefore they should only be cleaned with plain water using a cloth or brush, without using any detergents. 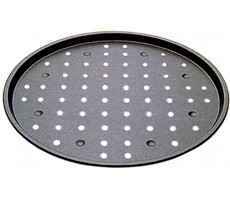 A good pizza pan is usually made of a thick layer of either cast iron, aluminum or aluminized steel. These thick metallic pans absorb and accumulate a lot of heat in very short time and are able to distribute that heat rapidly to the bottom of the pizza crust, bringing in very little time the whole pizza to the same uniform oven temperature. Therefore, just like with the stone, the crust is able to cook uniformly resulting with no danger of the bottom getting burned by the time the pizza toppings are cooked. Pizza pans do not have the microscopic pores found on pizza stones that absorb the humidity from the dough and help form a crisp crust. To compensate for that, and mostly in thinner pizza pans, tiny holes are perforated on their surface. Note that these holes are not needed when the pan is made of thick metal that retains a lot of heat. The main advantage of pizza pans over pizza stones is that they do not break or crack if they undergo drastic temperature changes or if they are dropped. They can be placed in hot ovens with no worries. Also they can be washed with non-caustic soap or non-caustic detergents as they won't absorb liquids. But the detergent should be washed off with lots of water before the pan is dried. So which to use: a Stone or a Pan? In either case, heating rapidly the bottom of the pizza and reaching rapidly a uniform temperature throughout the pizza while baking are the main requirements for best results. Both type of pizza supports achieve these two points in their own way as described above. 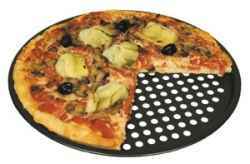 You will find below a selection of the best pizza stones and pizza pans available on Amazon. 1. Pizza stones come in various prices. You should be careful when you select your pizza stone as those that are very low priced will not last as long and may eventually crack. 2. If you buy a pizza stone or a pizza pan do not forge to get also your pizza peel and pizza wheel which facilitate greatly handling the hot pizza. Pizza peels are required to transfer the pizza dough onto the hot pizza stone or pan, and the cooked pizza from the hot pizza stone or pan onto a cutting board. Pizza wheels are used to cut easily the pizza into slices. Both tools are offered below in the Amazon section. 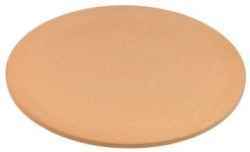 You will find below a selection of high quality durable pizza stones. Some of these products are sold at good discounts with respect to their List Price. If a discount is available, the List Price and the actual Amazon price will be shown when you click the images below. Please click the selected pizza stone to check the stone size, the price, other product info or to purchase. You will find below a selection of excellent pizza pans. Some of these products are sold at good discounts with respect to their List Price. If a discount is available, the List Price and the actual Amazon price will be shown when you click the images below. Please click the selected pan to check the pan size, the price, other product info or to purchase. Pizza Peels are required to transfer the pizza dough onto the hot pizza stone or pan, and the cooked pizza from the hot pizza stone or pan onto a cutting board. Pizza Wheels are used to cut easily the pizza into slices.